Highlights of this year’s Financing & Innovation Conference include a keynote address by U.S. Secretary of Agriculture Tom Vilsack, a panel of other top USDA officials, a panel of Fellows from the current class of FamilyFarmed’s Good Food Business Accelerator (GFBA), business pitches by several GFBA Fellows and other entrepreneurs, the annual Financing Fair, and an afternoon of outstanding panels featuring top investors, entrepreneurs and success stories from the Good Food sector. To learn more about the Good Food Festival & Conference — which include Friday’s Good Food Trade Show & Industry Conference and Saturday’s celebratory Good Food Festival, please click here. To purchase tickets, click here. FamilyFarmed holds strongly to values shared by organizations and individuals across the Good Food movement. Our definition of Good Food is food produced as locally as possible using sustainable, humane and fair practices. Where FamilyFarmed stands out is in its work to advance the business of Good Food, working with entrepreneurs, business leaders, investors and policymakers to accelerate the growing for healthier, more sustainable, and yes, tastier food. Nothing embodies this commitment more than the annual Good Food Financing & Innovation Conference, which takes place Thursday (March 24) in Chicago as the first day of FamilyFarmed’s three-day Good Food Festival & Conference. Over the past four years, food and farm entrepreneurs have raised more than $23 million in debt and equity funding through their participation in the Conference and the Good Food Business Accelerator (GFBA), a program launched in 2014 to provide more direct assistance to cohorts of competitively selected entrepreneur Fellows. The Financing & Innovation Conference is co-chaired by Michael Bashaw, president of Whole Foods Market’s Midwest region, whose stores stock many products from local farms and processors; Marc Schulman of Eli’s Cheesecake, who emphasizes sustainable and local sourcing and works closely with the Chicago High School for Agricultural Sciences; and Jennifer Worstell of the Chicago law firm Natarajan/Worstell LLC, a member of the FamilyFarmed Board of Directors. 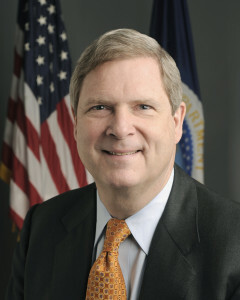 Tom Vilsack, the U.S. secretary of Agriculture under President Barack Obama since 2009, will deliver a keynote address on Good Food Public Policy at FamilyFarmed’s Good Food Financing & Innovation Conference Thursday. 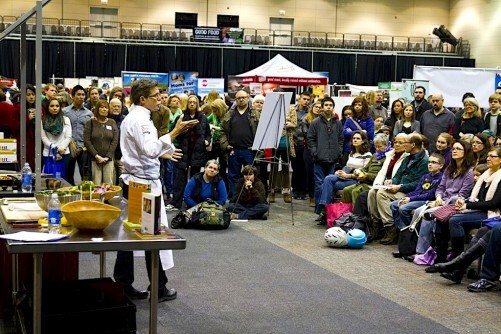 The Good Food Festival & Conference is the oldest and largest annual event devoted to local and sustainable food in the Midwest, and it has also attracted a growing number of policymakers who are aware of the increasing size and economic, job-producing potential of Good Food. This year, the keynote address at the Financing & Innovation Conference will be delivered by U.S. Secretary of Agriculture, Tom Vilsack, the first Cabinet member to participate in the Good Food Festival & Conference. 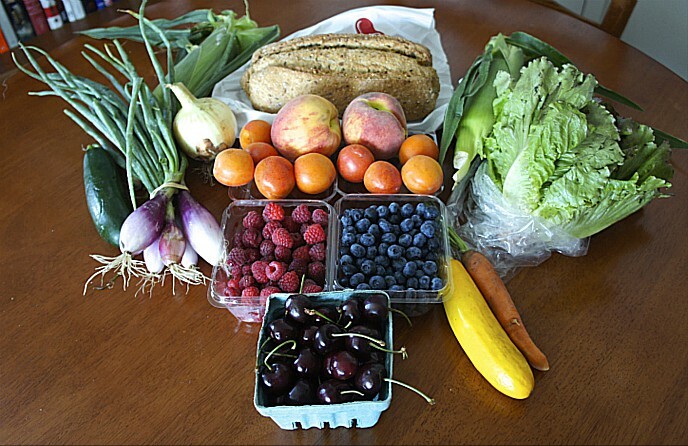 Vilsack’s agency administers the national Organic Program and a growing number of programs that assist new and beginning farmers, small and mid-sized farms, and farmers markets. He will discuss these matters during his speech, titled “Good Food Public Policy,” scheduled for 9:15 a.m. Thursday. This will be followed by a panel on “The Intersection of Public Policy and Good Food Entrepreneurship” featuring three other leading USDA officials: Sarah Eckhouse, chief of staff, USDA Agricultural Marketing Service; Michael Alston, associate administrator, USDA Risk Management Agency; and Sam Rikkers, administrator, USDA Rural Development Agency. Marianne Markowitz, Midwest administrator for the U.S. Small Business Administration, will introduce the panel. 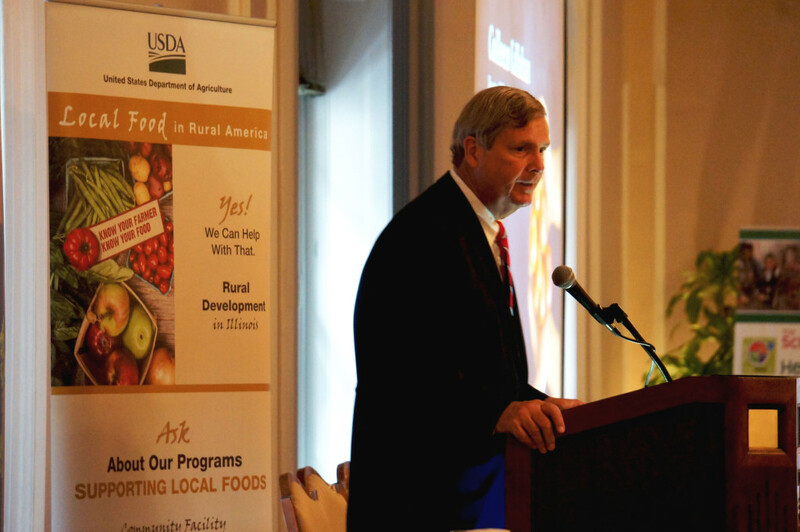 U.S. Secretary of Agriculture Tom Vilsack spoke at a “Know Your Farmer, Know Your Food” symposium in Chicago on Sept. 11, 2015. The program featured USDA programs that assist small and medium-sized farmers, new farmers, rural development, and farmers markets. The USDA program will segue into the conference’s Opening Symposium. Moderated by FamilyFarmed President Jim Slama, the lineup includes Michael Bashaw of Whole Foods Market; Danielle Gould, CEO of the business-oriented Food + Tech Connect website; Raj Karmani, founder and chief impact officer of Chicago-based Zero Percent, which fights food waste by connecting businesses that have surplus food with nonprofits that provide assistance to the needy; David Miller, CEO of Iroquois Valley Farms, which invests in farmland and rents it to family farmers who convert it to organic standards; and George Siemon, CEO of Organic Valley, a leading marketer of organic dairy and produce. Organic Valley will be honored as FamilyFarmed’s Good Food Business of the Year following the Opening Symposium. Riana Lynn, an entrepreneur Fellow in the first cohort of FamilyFarmed’s Good Food Business Accelerator, pitched her business plan at the Family Farmed’s Good Food Festival & Conference in March 2015. 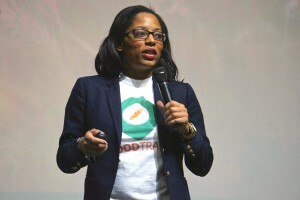 Lynn’s company FoodTrace provides a technology platform that connects producers and buyers of Good Food. The Good Food Business Accelerator then takes center stage. After an introductory speech on Business and Innovation in Chicago by Howard Tullman , CEO of 1871 — the city’s center for entrepreneurial innovation and home of the Good Food Business Accelerator — a roundtable moderated by Slama will feature five of the Fellows in the current second GFBA cohort: Daniel Cabellero of Sofrito Foods, Tony Fiorenza of Wind Ridge Herb Farm, Javier Haro of Food He.ro, Ryan Jones of Gotta B Crepes and Adriana Saldana-Meadath of Flur bakery. They will be joined by Kimberly Jung of Rumi Spice. After this panel, six entrepreneurs will present business pitches to an audience that includes attendees from the Good Food financing community. The presenters include four GFBA Fellows — Rachel Bernier-Green of Laine’s Bake Shop; John Biondi of The Cider Farm; Susan Fink of Karma Kombucha, and Josh Katt of Kitchfix — along with Kevin Sabo of Tiny But Mighty Popcorn and John Schiff of the Real Good Juice Co. The pitches will be moderated by John Wellehan, GFBA managing director. 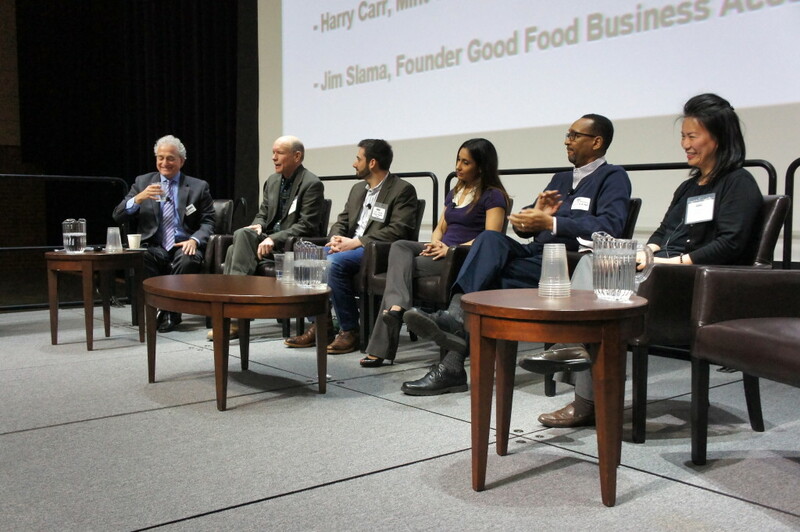 Fellows in the 2014-15 Good Food Business Accelerator program participated on a panel at FamilyFarmed’s Good Food Financing & Innovation Conference on March 19, 2015. From left, Jim Slama, president of FamilyFarmed, and Fellows Harry Carr of Mint Creek Farm; Nik Jacobs of Jacobs Bros. Farms; Rowida Assalimy of Kishr; Thomas Frierson of Spark of the Heart; and Jenny Yang of Phoenix Tofu. After a lunch provided by Farmer’s Fridge and Eli’s Cheesecake comes the Financing Fair, at which 26 businesses will exhibit (click here for the list of exhibitors). All nine of the current GFBA Fellows and two from the first cohort in 2014-15 (Spark of the Heart and The Urban Canopy) will be among the participants. The Financing Fair funders are 1st Farm Credit Services, Accion, Chicago Community Loan Fund, The Chicago Farmers, Colonial Funding Group and Iroquois Valley Farms. • Good Food Trends (2 p.m.- 3 p.m.): This panel about business developments in the evolving Good Food sector is made up of Brandon Barnholt of KeHe Distributors; Andrew Lutsey, CEO of Local Foods Chicago, the innovative distributor and grocer of fresh and packaged goods from the Midwest; Katrina Markoff, president of Vosges Haut-Chocolat and Wild Ophelia brands, who was profiled just this Sunday in the Chicago Tribune; and Tony Olson, CEO of SPINS, the nation’s leading data analysis and consulting company in the natural foods sector. The panel will be introduced by Mari Gallagher, a researcher best known for her work that raised public attention to connection between a lack of access to healthy food and diet-related illnesses, and will be moderated by Jamie Ponce, city of Chicago director of the C40 Cities Climate Leadership Group. Both Gallagher and Ponce are members of the FamilyFarmed Board. • Good Food is a Good Investment (3 p.m.-4 p.m): This panel includes leading figures from the Chicago Good Food financial community, which has had considerable growth over the past few years. Panelists include Bram Bluestein, managing partner of Bluestein Associates, who will moderate the panel; Victor Friedberg, co-founder and managing director of S2G Ventures; Steve Hall, vice president of small business lending development at Accion; Teri Lowinger, a founding member of the Sustainable Local Food Investment Group (SLoFIG); and Michael Schopin, partner in Zenfinity Capital. Lauren Rosenthal, also a SLoFIG partner and member of the FamilyFarmed Board, will introduce the panel. • Successful Food Business Exits (4 p.m.-5 p.m.): It is not uncommon for entrepreneurs who build successful businesses to seek buyers so they can move on and pursue other ventures. This panel on that subject is moderated by Marc Schulman of Eli’s Cheesecake and includes John R. Hall, president of Chicago Brewpubs Inc. and founder of the Goose Island beer company; Scott Mandell, founder and CEO of Enjoy Life Foods; and Matt Matros, founder and board chairman of Protein Bar, a growing chain of fast-casual restaurants featuring health-conscious menus. Charlotte Flinn, chairman of the FamilyFarmed Board, will introduce the panel. The Financing & Innovation Conference will wrap up with a craft beverage reception offering spirits, beer, wine and tasty snacks from local and regional Good Food producers. For more details about the Good Food Financing & Innovation Conference, please click here. To purchase tickets, click here. This entry was posted in Farm businesses, Financing, Food Entrepreneurs, Food policy, Food waste, Good Food and economic development, Good Food Business Accelerator, Good Food business development, Good Food Festivals, Good Food Financing Fair, Good Food marketing, Good Food Policymaking, Good Food Success Stories, Sustainable conferences, Sustainable food business investment and tagged 1871, 1st Farm Credit Services, Accion, Bluestein Associates, Chicago Community Loan Fund, Colonial Funding Group, Eli's Cheesecake, Enjoy Life Foods, FamilyFarmed, Farmer's Fridge, Food + Tech Connect, Good Food Business Accelerator, Good Food Festival & Conference, Good Food Financing &Innovation Conference, Iroquiois Valley Farms, John R. Hall, KeHe Distributors, Local Foods Chicago, Mari Gallagher, Organic Valley, Protein Bar, S2G Ventures, SLoFIG, SPINS, The Chicago Farmers, Tom Vilsack, U.S. Department of Agriculture, Vosges Haut-Chocolat, Whole Foods Market, Zenfinity Capital, Zero Percent. Bookmark the permalink.